Golf fans around the world have long admired the talent of Minjee Lee but there is a new Lee to take note of, her little brother Min Woo. 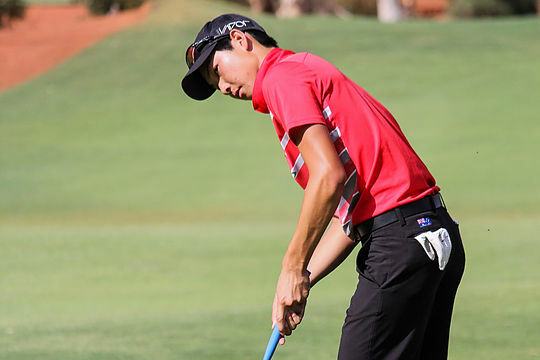 Playing in the TX Civil and Logistics WA PGA Championship Min Woo Lee fired a course record 8-under 64 at Kalgoorlie Golf Course to lead after the first round. Lee will head into the second round a shot clear of his playing partner Jason Norris, R.J. Caracella and Daniel Nisbet. “I am pretty excited, that is one of my lowest rounds, and it feels awesome getting a course record,” said Lee. In just his second tournament as a Professional, Antonio Murdaca is 6-under the card after the first round as is West Australian Brody Ninyette. The pair round out the top-5 on the leaderboard. Tournament drawcard Brett Rumford fired 5-under 67 in his first tournament since making the cut at The Open. He is joined by Andrew Evans on the leaderboard in a tie for 7th. A group of seven players round out the top-10 on 4-under the card after the first round.